Early in our visit to the Frisco center, I met briefly with Gene. He suggested that we also visit the Breckenridge center and meet with his brother, Tom Dayton, who is more into snowshoeing and conducts guided tours out of the Breckenridge center. A meeting with Tom was then arranged for the following morning. We arrived at Breckenridge Nordic Center shortly after it opened and were able to check it out and meet with manager Claudia Wiley. We learned very quickly that snowshoeing is growing in popularity and accounts for an increasing portion of their business. According to Wiley, snowshoers make up about a third of their customers during the week and up to half on weekends. Demographically, snowshoers at the center run the gamut from young children to the more mature, like us. 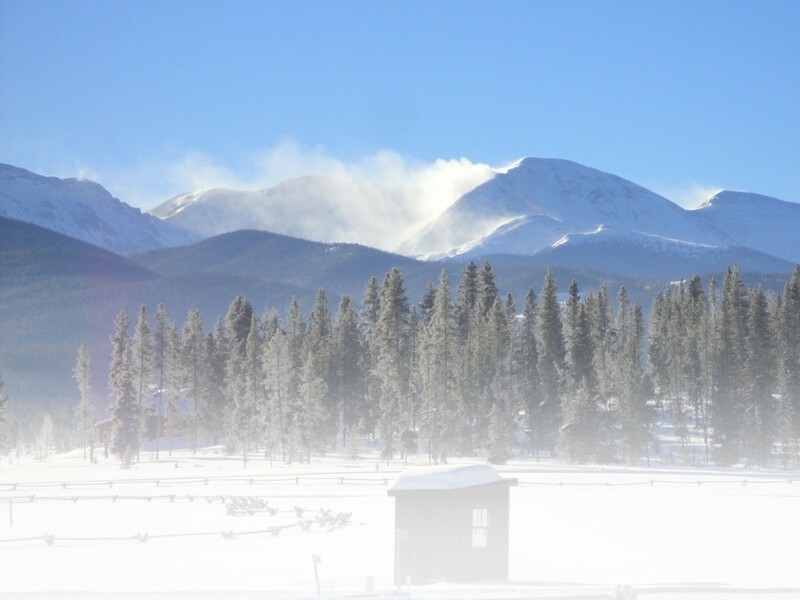 In order to cater to this growing market, the Breckenridge center has carved out 17 kilometers of dedicated snowshoeing trails. Upon seeing a steadily increasing number of snowshoers, Tom Dayton decided to add guided tours to the mix for the 2003-2004 season. Tom has been involved with the business in some capacity since 1982. He has worked in the center, helped in designing the trails, and was in charge of trail grooming for many years. In the off season, Tom works as a bush pilot in Alaska, flying hunters and fishermen to and from their favorite spots. After talking with Tom for over an hour, we decided that the best way to get a true feel for his snow tours was to go on one ourselves. Before we knew it, we had signed up for a half-day trek with ‘S No Wonder the following day. The half-day tours last about three hours and the cost is $35 per person. Water and healthy snacks are provided. The exact route and level of difficulty are determined by the preferences and abilities of the participants. Those who don’t have their own snowshoes can rent them at the center for $12 a day. Since the members of our tour were experienced, physically fit snowshoers, Tom decided to take us on a moderately strenuous hike to the Peak Seven area. Tom’s dog, Cinder, happily accompanied us. While on the tour, we hiked over packed trails and, with Tom leading the way, broke some new ones through some deep powder. Snowshoes were a necessity on most of these trails. An advantage of a guided tour is that the guide provides interesting information about the forest and creatures that inhabit it. Tom identified for us many of the trees and showed us the effects that storms and logging activities have on the terrain. We noticed many tracks in the snow left by various animals such as elk, deer, and the ubiquitous snowshoe hare. After hiking uphill through the forest for over an hour, we broke out into an open meadow that led to the Hallelujah Hut, a beautiful log structure built by owner Gene Dayton. The hut served as a rest stop and we were able to rest and relax amidst the modest but comfortable furnishings while we enjoyed welcomed snacks and water. Afterward, we stepped out on the porch to enjoy beautiful Rocky Mountain views and capture some of them and each other in photographs. Most of the return trip was downhill and, for the most part, followed a different route than the first leg. We alternated between open and forested terrain as we made our way back. When Tom broke a trail near deep powder, he demonstrated the proper way to regain our footing should we step off and fall down in the powder. We arrived back at the nordic center tired but enthusiastic about what we had experienced. Never having been on a guided snowshoe tour, we agreed that it was a good way to see and do things we couldn’t have experienced safely on our own. In addition to the half-day tours, Tom Dayton also conducts all day tours and night tours when weather permits. The all day tours cost $59 per person and include lunch. Nighttime tours last approximately an hour and a half and cost $21 per person. It’s a good idea to check with the Breckenridge Nordic Center ahead of time to reserve a place, although walk-ins are accepted if space is available. The phone number for the center is 970-453-6855 and their Web site is http://www.breckenridgenordic.com. The tranquility and silence of forest and trails, covered with a blanket of snow, gives you a totally different experience than that of the mountains in summer. ‘S No Wonder Tours is a great way to experience this for yourself.